Instagram introduced a massive feature last week: a fully functional mobile web app. This means you can now upload photos to Instagram from your mobile web browser without the Instagram app. This is a huge change as it unlocks a door. Instagram didn't officially make this feature available in desktop browsers, but the door is now open and you just have to find it. Many Instagrammers upload photos to Instagram, but those photos are not necessarily taken by or edited on their phones, especially if they use a DSLR camera. And the process of preparing photos on a desktop and sending them to your mobile is at best a pain - from AirDrop to email. This trick will save your time and that pain. So, this trick will save you time and that pain! Most browsers have ways of letting the website know your real or intended "User Agent." This is how the website knows the device you're using to visit it and how it should look like for you -- and remember you can change it. Therefore, you can trick Instagram website on your desktop browser to act as of you're visiting it from a mobile browser and let you upload photos to Instagram from your desktop browser. Therefore, you can trick Instagram website on your desktop browser to act as if you're visiting it using a mobile browser and let you upload photos to Instagram from your desktop browser. That's how we're gonna do it here. Go to Instagram.com and sign in. Now, right-click on the page and select Inspect. Click on the Tablet/mobile icon on the top-left of the new menu. Choose a mobile device from the menu and click on it. Remember, it doesn’t matter what type of phone you selected, it just adjusts the screen size based on your selection. Then, in mobile view, you’ll see a camera button, just like the one in the app, at the bottom of your screen. Use it and upload your photo. In Opera, you can do exactly as you would do in Chrome as it now uses Chromium. With Safari, it’s even easier. Go to Safari -> Preferences -> Advanced . At the bottom, find “Show Develop menu in menu bar” and make sure it’s check. Now, on the menu bar, go to Develop -> User Agent -> Safari — iOS 10 — iPhone . Now, open Instagram.com and log in. 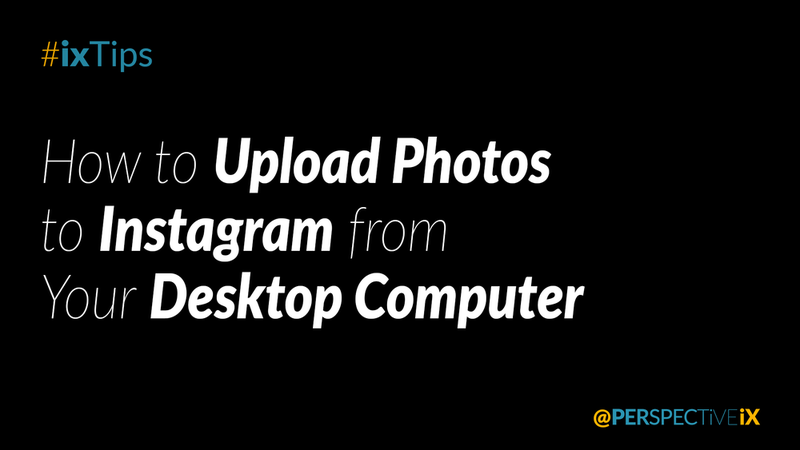 Click on the camera at the bottom to upload your photo to Instagram from your desktop browser. If you don’t want the “User Agent” to affect your web surfing experience (it shouldn’t normally, but you know…), open a Private Safari Window and apply the technique on that window. Note: Video uploads, filters, Stories, and Direct Messaging still are not available on the web app (as of 15/05/2017).